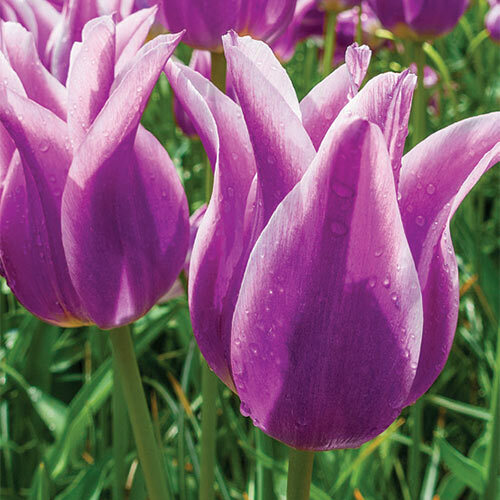 Not all tulips are created equal… and this exceptional variety is a perfect example of a flower that stands head and shoulders above the rest. Ballade's unique and sophisticated shape is matched in beauty only by its chic, brilliant red-magenta petals that are edged in snowy white. It's no wonder this lily-flowering type has won multiple awards over the years. Growing to a substantial 20-22", the flowers have a strong texture that withstands weather and make a delightful addition to cut-flower arrangements. Back borders come alive with their vibrant color and elegant form. For best results, plant in groups in full to part sun and well-drained soil. Elegant, vase-shape. Pointed petals. 5" in length. Blue-green, linear or broadly ovate.